Across our business, technology is a key enabler in delivering a frictionless customer experience. We are experts in delivering blended technology solutions in partnership with our Clients and bringing together state-of-the-art tools from our global technology partners to push the boundaries of our business. Our teams of highly skilled and empowered staff work together to bring out the best in each system we use, ensuring that day-in, day-out we continue to deliver excellence for our Clients across the globe. 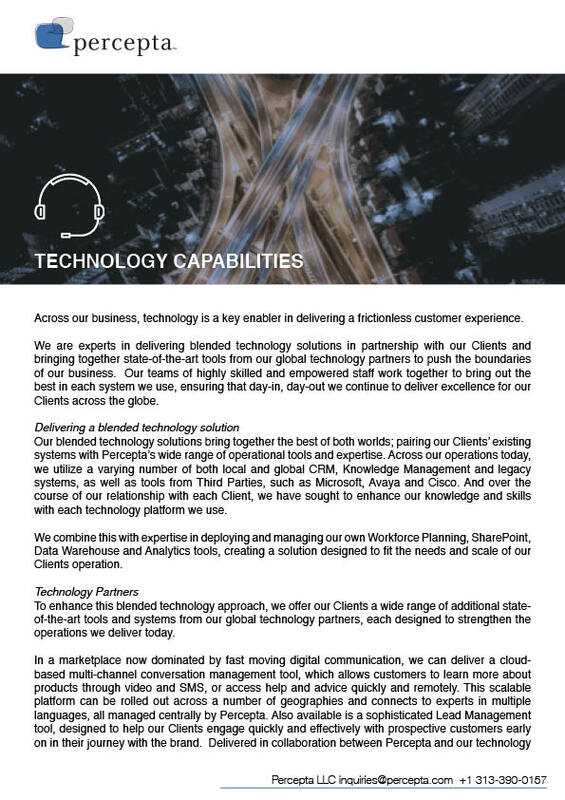 Our blended technology solutions bring together the best of both worlds; pairing our Clients’ existing systems with Percepta’s wide range of operational tools and expertise. Across our operations today, we utilize a varying number of both local and global CRM, Knowledge Management and legacy systems, as well as tools from Third Parties, such as Microsoft, Avaya and Cisco. And over the course of our relationship with each Client, we have sought to enhance our knowledge and skills with each technology platform we use. We combine this with expertise in deploying and managing our own Workforce Planning, SharePoint, Data Warehouse and Analytics tools, creating a solution designed to fit the needs and scale of our Clients operation. To enhance this blended technology approach, we offer our Clients a wide range of additional state-of-the-art tools and systems from our global technology partners, each designed to strengthen the operations we deliver today. In a marketplace now dominated by fast moving digital communication, we can deliver a cloud-based multi-channel conversation management tool, which allows customers to learn more about products through video and SMS, or access help and advice quickly and remotely. 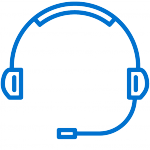 This scalable platform can be rolled out across a number of geographies and connects to experts in multiple languages, all managed centrally by Percepta. Also available is a sophisticated Lead Management tool, designed to help our Clients engage quickly and effectively with prospective customers early on in their journey with the brand. Delivered in collaboration between Percepta and our technology partners, these are just two examples of the ground-breaking tools we can offer today. Across each technology solution we use, we bring together true experts in customer experience and technology to ensure we continue delivering frictionless customer experiences.